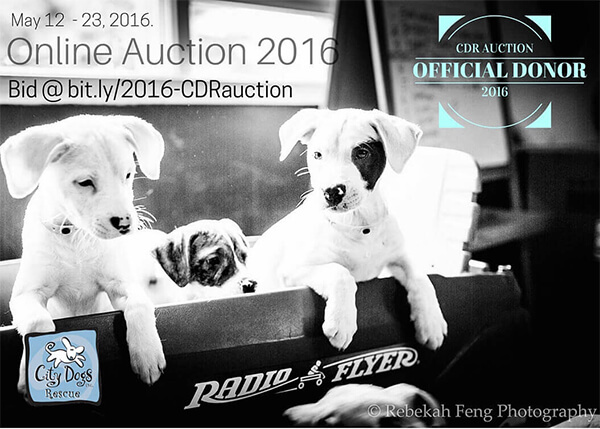 For the second year in a row, 9pm Studios is proud to have the opportunity to support the City Dogs Rescue DC Annual Online Auction. This year’s auction showcases artists, restaurants, theaters, and small businesses from across the District of Columbia metropolitan area. From wine tasting in Virginia’s rolling hills to sessions with expert pet photographers, and items from many popular retailers, you’re sure to find something you love, while helping to save dogs and cats from overcrowded and high-kill shelters. Among the hundreds of items up for auction is $400 worth of 9pm Studios services, including web design, digital marketing, branding, and graphic design. The auction is open until May 23 at 11pm. City Dogs Rescue is a 501(c)(3) non-profit organization based in Washington, D.C., that adopts dogs from overcrowded and high-kill shelters. Since its establishment in 2011, City Dogs Rescue has saved more than 2,000 dogs and recently started to rescue cats too! We have gained a strong community of volunteers along the way. In Washington City Paper’s 2016 Readers’ Poll, City Dogs Rescue was voted Best Non-Profit, Best Dog Rescue, Best Charity Event, and runner-up for Best Place to Volunteer. The Catalogue for Philanthropy recognizes City Dogs Rescue as one of the top charities in greater Washington based on its impact, financial viability, and transparency.